Some of the world's most powerful brands have teamed up in the quest to stop people falling for online lottery scams. Microsoft, Yahoo, Western Union and the African Development Bank have announced a coalition to combat the plethora of phishing schemes that are defrauding thousands out of their money. A collaborative effort will see the members attempting to spread the word that people should be wary of emails that purport to inform people that they have won a prize on a lottery – often asking for a small 'administration fee' to proceed. It's an incredibly obvious scam to many, but it tends to be the more vulnerable people on the internet and email who fall for it, and the group is keen to bring the practice to an end. Research has shown that one in 44 people surveyed have lost money to online scams, and 27 per cent of people were worried that they would fall victim to online fraud. Speaking at the 6th German Anti Spam Summit,Tim Cranton, Associate General Counsel for Worldwide Internet Safety Programs at Microsoft, said, "This online threat differs from those that try to exploit software code or attack computers. "Lottery scammers prey not on software, but on the hope of their victims — and with scams that can be so creative and plausible, internet users simply don't know whom they can believe. Microsoft is announcing this coalition with the African Development Bank, Western Union and Yahoo today with the goal of helping to better ensure end-to-end trust in the internet for everyone." George Hadjigeorgiou, General Manager of communication and community products in Yahoo Europe added: "As one of the world's largest web mail providers, reaching hundreds of millions of internet users, we realize that Yahoo is in a unique position to help educate consumers about dangerous scams online, and we have a special responsibility to help provide a safe online experience. "At Yahoo, we've long told our users that if it sounds 'too good to be true', it probably is. 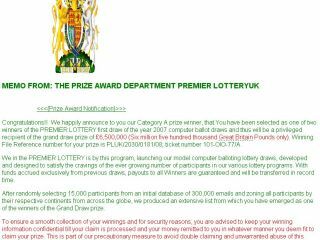 But as internet fraudsters continue to get more creative in their approaches, consumers continue to be deceived. "This unique initiative is a continuation of our online safety and trust initiatives and is intended to help support our consumer awareness efforts."